Police are repeatedly being called out to South Yorkshire hospitals spending thousands of hours dealing with incidents, figures show. In just six months from April 2017 to September 2017, officers dealt with 1,518 incidents across hospitals in Sheffield, Rotherham, Doncaster and Barnsley. The force spent 3,944 hours across the sites dealing with a variety of calls, the majority down to public safety. Police would be called if a patient leaves their hospital bed without being discharged or if a patient refuses to leave A&E when deemed medically fit to do so. South Yorkshire Police said the Northern General averaged 'four crimes a day' the other hospitals in South Yorkshire average 'two crimes per day'. Sheffield's Northern General, and the main hospitals across the rest of South Yorkshire are said to be in the top 10 call-out locations across the county for officers. The force said it has a 'dedicated' plan to reduce demand by working closer with health bosses and security teams. A South Yorkshire Police spokesman said: "For all demand locations, including hospitals, a prevent and demand reduction group holds monthly meetings to address any issues and look at opportunities for crime prevention and raising awareness. "A dedicated plan is put in place to reduce demand which can include a variety of actions including working with managers, partners and security. The aim is to understand the nature of the incidents and target resources appropriately. "Hospitals have a high-level of footfall within a limited geographical area and we continue to support staff, patients and visitors who may be affected by crime while on the site. "We will continue to work with hospitals and other repeat locations to put measures in place to protect members of the public, staff and patients." Kevin O'Regan, hotel services director at Sheffield Teaching Hospitals NHS Foundation Trust, said: “We are a large NHS Trust serving over two million patients across five hospitals sites, including the Northern General Hospital, and the safety of patients, staff and members of public is paramount. Dr Kirsty Edmondson Jones, director of estates and facilities at Doncaster and Bassetlaw Teaching Hospitals, said they work closely with police to maintain safety of staff, visitors and patients. 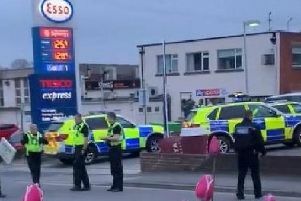 “If it is safe to do so, our clinical, medical and security teams will try to de-escalate any issues before calling for further intervention, however the police are called-on if it is deemed necessary by staff," she added. A spokesman from Rotherham Hospital said: "At Rotherham Hospital our in-house security teams are on site to help monitor and minimise anti-social behaviour. "When necessary we call on the support of our partners, South Yorkshire Police, should a situation escalate or become unsafe and we are working with SYP on a number of initiatives to reduce demand on their services. A spokesman from Barnsley Hospital said: "It is not uncommon for police to attend areas of the Trust for a wide ranging variety of issues. Barnsley Hospital places emphasis on the safety of patients and staff, however it is still a public place and therefore we will continue to work with South Yorkshire Police and other relevant partners when necessary."